Sen. Michael Sirotkin addresses the Senate Committee on Government Operations Thursday. 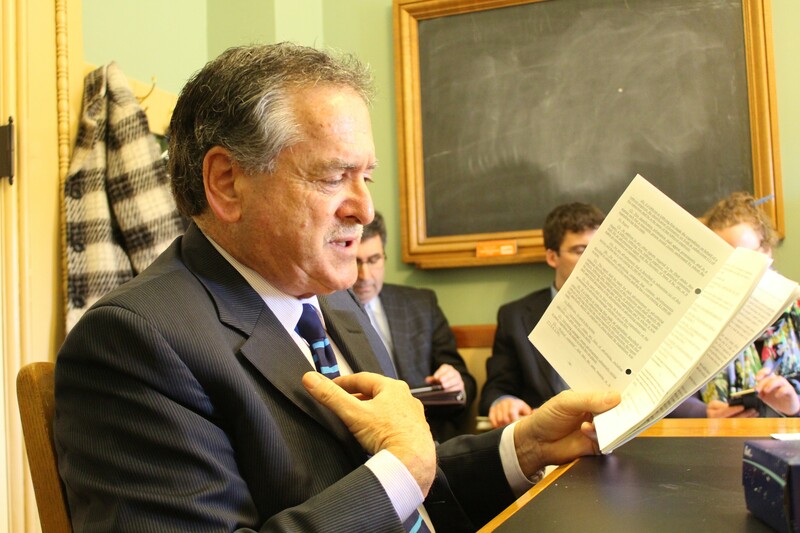 The Vermont Senate approved new rules Friday requiring lobbyists to quickly report how much they spend on advertising campaigns and to more regularly report their activities within the Statehouse. The legislation passed more than two years after former representative Mike Fisher, a Lincoln Democrat, proposed the idea. He was frustrated at the time that the soda industry had bought newspaper advertisements targeting him and others who supported a tax on sugar-sweetened beverages, but wouldn't disclose how much it had spent on the ads. The tax was defeated that year and Fisher himself was defeated in November 2014. Under current law, lobbyists and those who hire them must report just three times a year to the secretary of state's office how much they spend trying to influence lawmakers. Because only one of those dates falls during the four-month legislative session, it is impossible to know the true cost of a lobbying campaign until the fight is over. The Senate bill changes that in two ways. First, lobbyists and their employers would have to file disclosure forms six times a year — including monthly during the legislative session. Second, they would have to report within 48 hours when they spend more than $1,000 on ads meant to influence the legislative debate. Such ads would have to clearly state the names of the top three entities financing them. "We're very pleased," said Vermont Public Interest Research Group executive director Paul Burns, whose organization pushed for the bill. "It's an important step forward for transparency and it will allow legislators and the public to know more about who's trying to influence them on important issues being debated in the building." The Senate had been scheduled to vote on final passage Wednesday, but a series of changes proposed by Sen. Michael Sirotkin (D-Chittenden) delayed the process. A former contract lobbyist himself, Sirotkin sought to strengthen the legislation by banning political action committees from raising money from lobbyists during the legislative session. Though individual legislators are currently barred from doing so, Democratic and Republican PACs routinely hold fundraisers during the session to collect campaign cash from those seeking to influence them. Sirotkin withdrew that proposal Thursday after hearing from the attorney general's office that such restrictions might not pass constitutional muster. Instead, he decided to address the situation by requesting that PACs disclose their fundraising and spending activities near the end of the session. He also proposed shortening the period of time lobbyists would have to fill out disclosure forms. The Senate Committee on Government Operations opposed Sirotkin's amendment Thursday on the grounds that it might imperil the underlying bill. "I don't want to sound like the softy here. I'm for all disclosure all the time," said Sen. Anthony Pollina (P/D-Washington), who introduced the legislation. "But eventually this bill has to get to the floor." Sirotkin found little more success Friday when the entire Senate took up his amendment. "I want to strengthen the knowledge of legislators as to what is going on in the lobbying arena," he told his colleagues. But Sen. Jeanette White (D-Windham), who chairs the government operations committee, said that while she was "all about transparency" and "not interested in protecting lobbyists," she did not believe her committee took sufficient testimony to defensibly single out PACs for more disclosure. Sen. Kevin Mullin (R-Rutland) proposed a novel approach to limiting lobbyist fundraisers: self-imposed abstinence. "I would just like to state the obvious: that perhaps the most elegant solution to this wouldn't even require this being addressed in a future bill," he said, "but simply an agreement by the leadership of both the House and Senate that no legislators will attend these type of fundraising events by organizations that are specifically designed to ... create campaign contributions for the legislators who are in attendance." Mullin's colleagues did not rush to endorse his idea. Sirotkin eventually withdrew the portion of his amendment that would have mandated additional PAC disclosure, and the remaining provision was defeated by a vote of six to 19. The underlying bill passed by a voice vote. It now heads to the House for consideration.